Our memberships entitle you to substantial discounts from our already-low event and music-class prices. In fact, attending just 3 of our regular shows in a year pays for an individual membership. You'll also enjoy discounts on our group music classes and workshops. Membership is a no-brainer! The Rose depends on ticket sales, memberships, and the kindness of donors for its financial health. Your membership will enable us to bring you the best in traditional acoustic music, weekly jams, and fun, group classes. (It also subsidizes those tasty, inexpensive, home made treats at our shows.) By becoming a member or renewing your membership, you'll help us to keep our prices low and our value to you and the community high. 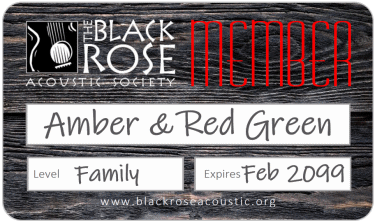 Won't you consider supporting the arts with a Black Rose membership? Become a member here.